This fall, visitors to the Museum are enjoying three newly acquired works from the Rouen Cathedral series by Brazilian artist Vik Muniz, inspired by Impressionist master Claude Monet’s well-known paintings. The three artworks were purchased for the Museum by its newly founded Contemporary Collectors Circle (CCC), whose goal is to transform the Museum and the city through the acquisition of major works of contemporary art. The concept for the CCC was born out of the personal experiences of Matt Felton, a Museum Trustee with a passion for modern and contemporary art. The group believes this initiative will not only benefit the Museum immediately, but will also have the long-term effect of positioning the institution and Portland as a national and international destination for 21st-century art. 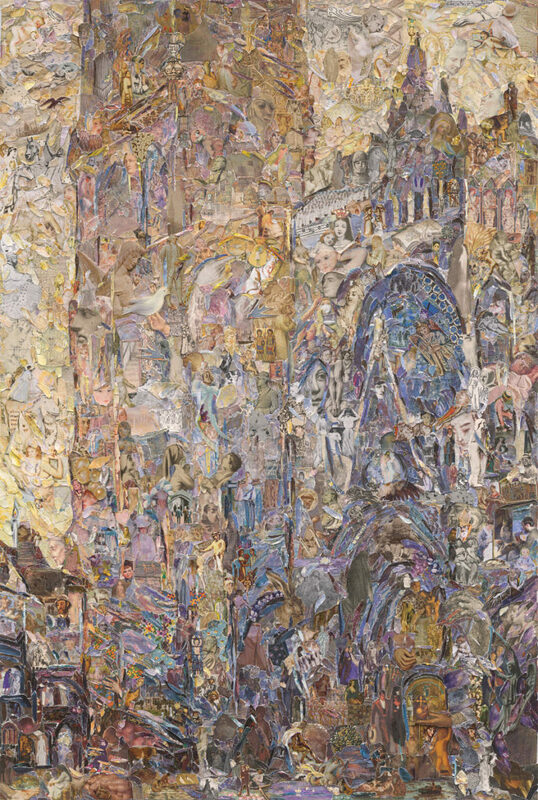 The three works reimagine a famous Claude Monet painting of Rouen Cathedral. On the surface it appears as if Muniz has recreated Monet’s impressionistic brush strokes. Yet on closer look, we see the multitude of images of other works of art cut from magazines, catalogs, and art books that compose the animated surface—an art history primer contained in a reference to an iconic work of 19th-century European painting. “The selection of these wonderful works by Vik Muniz demonstrates the aims of the group—to acquire art works that are engaging with a show-stopping impact,” said Sara Krajewski, The Robert and Mercedes Eichholz Curator of Modern and Contemporary Art. The Muniz photographs are now on view in the Luwayne E. “Buzzy” Sammons Gallery. For more information about joining the Contemporary Collectors Circle, please call Elizabeth Thomas at 503-276-4206.